Vacuum Elevators. Are going to install an elevator in your home or Office? Forget about the concrete box, cables, pulleys or pistons. Today we can move people to upper floors in pneumatic elevators such as we saw in the old films of science fiction, where people were transported in one cristal capsule, without the aid of wires. This extraordinary technology has made the future becomes reality. 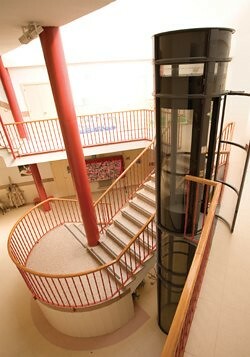 Vacuum elevators are also known as pneumatic elevators. These consist in the combination of a cylindrical stack with smooth inner surface and a coaxial cab to the vent that moves inside. The vertical cylindrical duct is a self supporting structure, light and resistant polycarbonate. 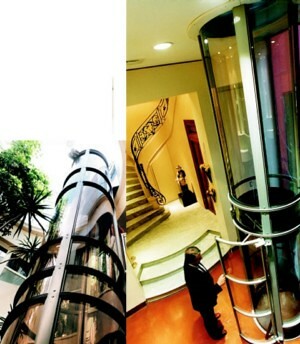 Vacuum Elevators looks so high-tech and futuristic, making it a good addition to a modern residential building. Plus, there is no need for cables, pulleys and pistons as this elevator only makes use of air pressure to function. 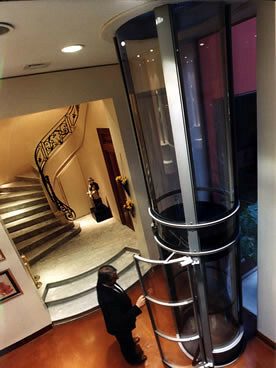 This kind of elevators contributes to the elimination of architectural barriers and facilitates accessibility with a touch of style and distinction. Which means that it supports on itself so it does not require retaining wall. You can set it directly on any existing floor and because of its weight, small size and lack of needing to pit, it is the ideal equipment to be installed in apartments, Lofts and in those places where the total weight of the equipment is a something to take into account. There are many reasons why homeowners prefer getting a pneumatic elevator installed in their homes to other types of residential elevators. -Does not require civil works, is self supporting and does not require excavation or machine room. -Is an not-fixed installation, so it can be dismanteled and transferred easily. -They ensures absolute safety: In a power cut, the cabin descends automatically to immediate downstairs. -Its light weight allows the installation of Duplex or Triplex indoor horizontal property.